CHILI SIN CARNE (meatless chili) scroll down for recipe in English… Dans cette recette de mon cru, vous ne trouverez pas de tofu comme substitut à la viande. Je ne suis pas fan du tofu haché et en sauce, je préfère celui-ci mariné et/ou grillé. De plus, mon chili ne contient pas de haricots rouges… Je n’aime pas trop la peau coriace de ces derniers, qui empêche les saveurs de pénétrer au coeur de « la bean », ni leur couleur qui n’est pas mise en valeur dans une sauce toute rouge. Vous vous demandez peut-être ce qu’il contient, mon chili, comme protéines? Des pois chiches et des haricots noirs, qui sont mes deux légumineuses favorites. Cette recette, en plus d’être super simple d’exécution et très économique, est vraiment saine, pleine de texture et de couleur, et surtout débordante de saveur. Son secret réside dans sa base aromatique: des épices de qualité, une quantité généreuse d’ail, et des légumes qu’on fait longtemps suer avant d’y ajouter les liquides, afin de laisser le temps aux végétaux de concentrer leurs saveurs, et aux épices de bien parfumer l’huile de cuisson. Elle a obtenu un vif succès le soir de sa création, et personne ne s’est plein de l’absence de viande, tellement ce chili est généreux et tout sauf fade. Pourquoi ne pas accompagner votre chili de cornbread (pain de maïs) au jalapeno? Faire chauffer l’huile dans une grande casserole à feu moyen-doux. Y faire suer l’oignon, le céleri, la carotte et l’ail en plus d’y mettre les épices à chili, le paprika, le cumin et un peu de sel. Cuire pendant au moins 10 minutes, pour que les légumes perdent de l’eau et que toutes les saveurs se concentrent. Ajouter ensuite les haricots, les pois chiches et le maïs, égouttés et rincés. Bien amalgamer. Ajouter la passata (sauce tomate) et le piment chipotle haché (avec un peu de sa sauce) , saler au besoin, couvrir et laisser mijoter 20-25 minutes. Ajouter le poivron rouge haché et laisser cuire à couvert un autre 15 minutes. Retirer du feu et ajouter la coriandre hachée. Rectifier l’assaisonnement et servir, avec les garnitures au choix. 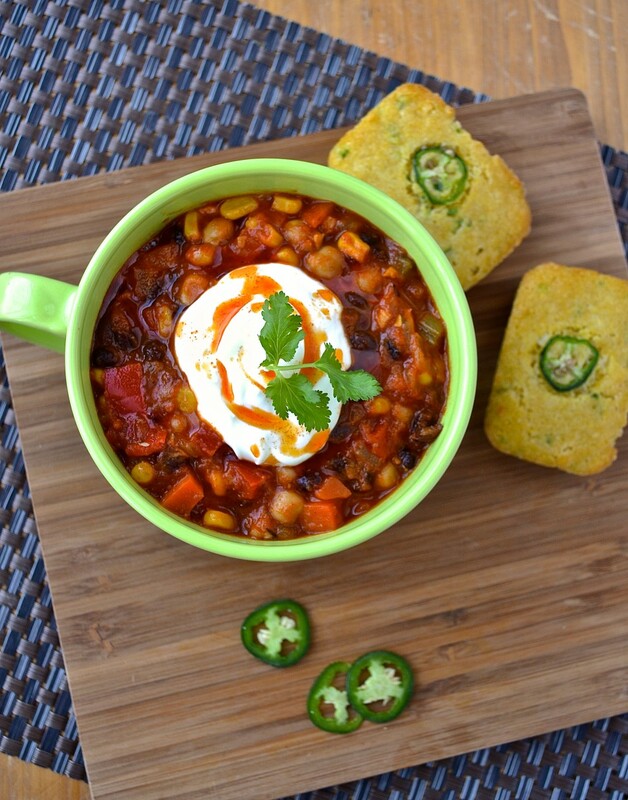 I love chili and this vegetarian version has nothing to envy of the traditional con carne one. It does not contain tofu, which I do not enjoy when crushed and added to a sauce. I love tofu, but it has to be diced / sliced, marinated and sauteed, not ground. My chili does not contain any red kidney beans either. I am not the biggest kidney bean fan (I dislike their colour in a tomato-based sauce, and find their skin too thick ) Instead of red beans, I used chickpeas and black beans, which I find more delicate and interesting. 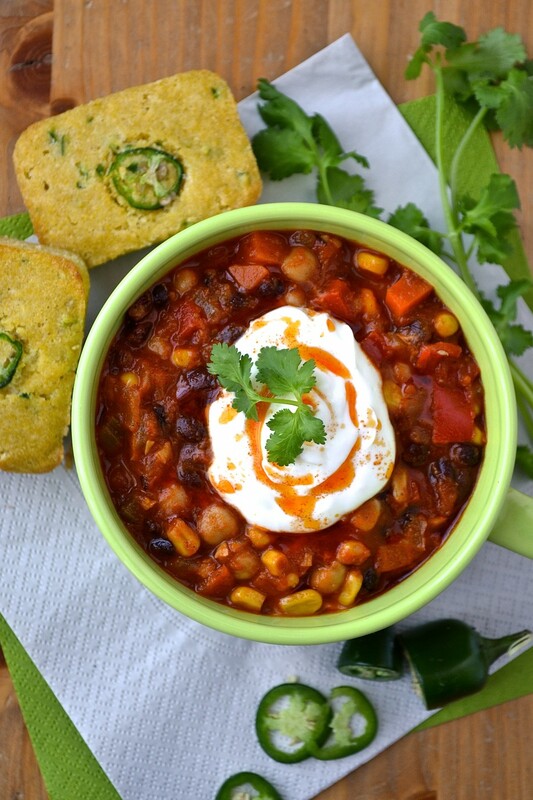 Apart from being extremely simple to make and budget friendly, this chili is super healthy, loaded with different textures and colours, and very tasty. Its aromatic secret: the use of a generous amount of good quality spices, and vegetables that cook in a small quantity of oil (with the spices) for at least 10 minutes, before liquid is being added to the recipe. The veggies lose a lot of water so their flavours concentrate, and the spices activate all their aromatic powers… The first time I made this chili, nobody complained about the absence of meat, and the chili was a total hit. Angie (The Novice Gardener) started her Fiesta Friday blog event a few weeks ago… The idea of the Fiesta is to share something (picture, words, recipe…) that helps getting our groove back after a long week of work, and by doing so, inspire others. 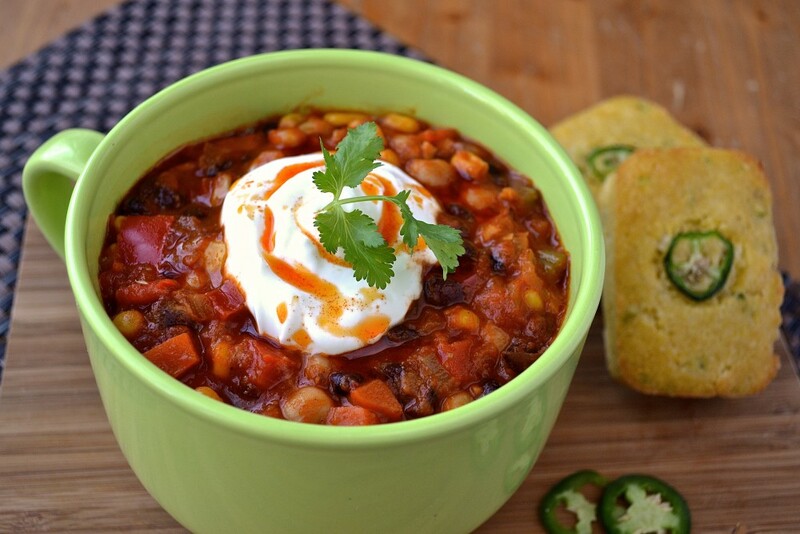 I have decided to share this recipe, because it’s 100% comfort for me, and chili + Fiesta are words that get along quite well! 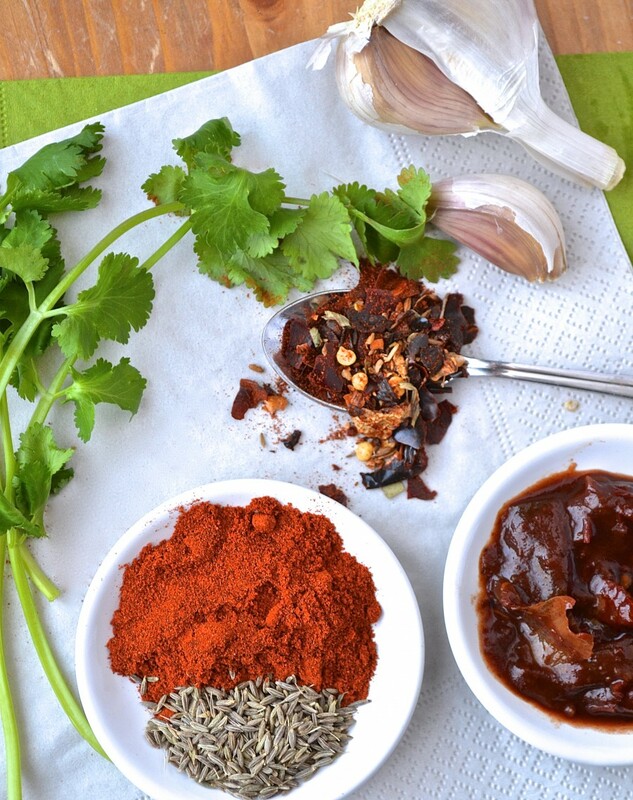 * Chipotle peppers in adobo sauce are 100% natural and imported from Mexico. They will add a smoky flavour, spiciness and a lot of depth to your chili. You will find them for under 3$ in the latin food alley of your supermarket. Heat the oil in a large saucepan on medium-low heat. Add the onion, garlic, celery, carrots, chili spices, paprika, ground cumin and a pinch of salt. Cook for at least 10 minutes to let the vegetables lose some of their moisture and the mixture gain some flavour. Strain and rinse the black beans, chick peas and corn, and add to the vegetables + spices. Then add the chopped chipotle with some of its adobo sauce (very hot, be careful!) and the passata. Stir well, add a pinch of salt (to taste), cover and cook on low heat for 20-25 minutes. Added the diced red bell pepper, cover and cook for about 15 minutes. Remove from heat and add chopped cilantro. Taste and add more salt if needed, and serve warm with your choices of toppings. Stumbled upon Fiesta Friday through Purdy’s blog (Butter, Basil and Bresdcrumbs). The photos are really convincing and the recipe sounds delicious. Where did you source your lovely white tin of chili spices? Hello Stacey! My chili spices are from The spicetrekkers ( http://spicetrekkers.com), a Montreal-based company. 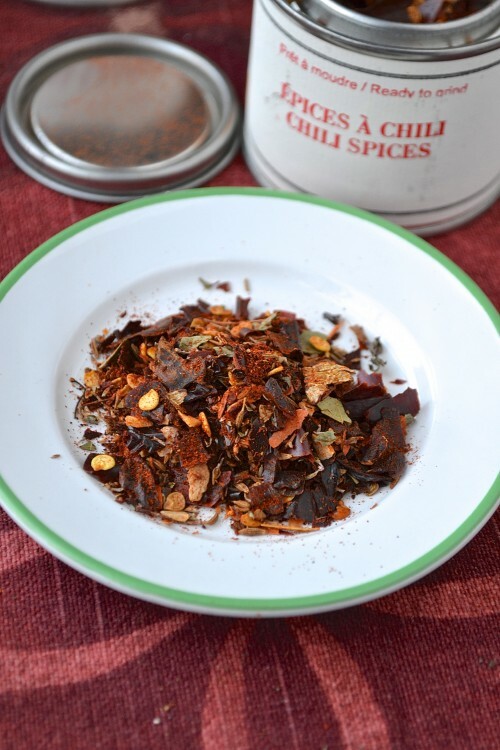 They sell wonderful, high quality spices, spice blends and teas. What I like about the spices is that they come whole, as seen on my photos, so they are super fresh and packed with flavour. You can easily order their products via their website. I bought many of their spice blends and have written a post about them ( look at the link in the recipe’s list of ingredients, http://catherinecuisine.com/2014/01/30/livraison-speciale-special-delivery/) . Thank you for your comment! Thanks, I will check out your post about spices. Did you leave your spices whole for the chili or did you crush them? Onto the cornbread next; can’t have chili without cornbread. No, I crushed them… All their spices are prepared to be ground. I used a mortar: it’s fun and it is the best way to get a maximum of flavour! If you don’t have one, you could use a coffee grinder..
Bonjour Catherine, ce Chili respire la vie et les vitamines ! Je te félicite de tout coeur pour cette belle recette que tu as la générosité de partager 🙂 ! You read my mind? I was so looking for a vegetarian chili recipe. On my list to make :). I also don’t like kidney beans! I usually use pinto or black beans, but I’ll have to try this recipe as well. Looks good! : ) thank you ! Such a good looking chili! Gorgeous photography, Catherine! Everything pops right off my computer screen! I love colourful photos 🙂 Have a great weekend ! Catherine, ton chile a l’air très délicieux! Ton blog est vraiment beau aussi, et j’ai hâte de le suivre. J’admire que tu l’écris en deux langues!! Thank you 🙂 Chipotles are something I will always have in my kitchen from now on! They are so flavourful! Just saw this on Fiesta Friday, so pretty! I love the flavors you used here. I’m not a red kidney bean fan either, so this recipe looks perfect for me. Beautiful photos! Your recipe looks great – very flavorful!. 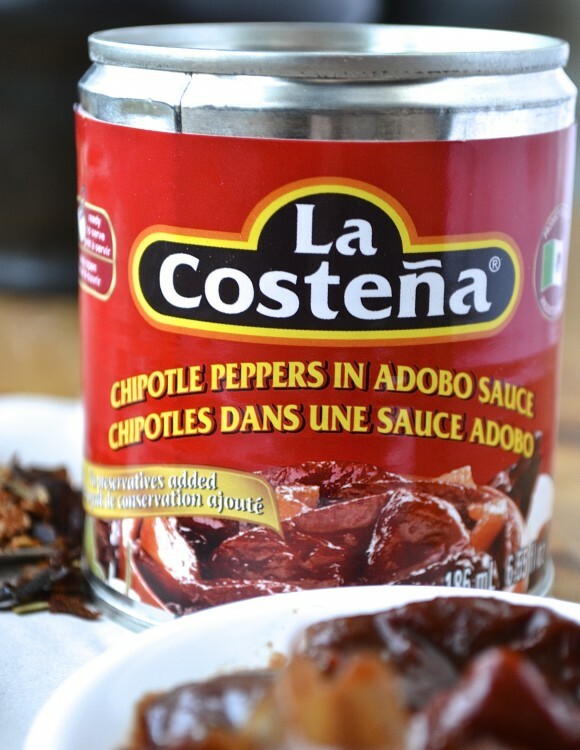 I love chipotle peppers in adobo sauce and I have also been adding it to many dishes recently! Wow, beautiful flavor-packed looking recipe . I like the choice of chickpeas and black beans. The cornbread and spicy oil look great too! Thank you Gerard : ) I put a lot of spices, absolutely! ça à l’air bon!! je tenterai bientot! Merci! Tu m’en donneras des nouvelles! Même au petit déjeuner, ca me donne envie de gouter! Et les photos sont vraiment très appétissante! C’est bon Catherine! j’aime bien les couleurs de ton Chili sans viande… avec tes petits pains à la farine de maïs ça va être un mariage parfait!